I fortuitously stumbled across this blog while looking for old film images: Papa Ajoba. It is a fantastic site written by Anuja Ghosalkar, the granddaughter of Ram Tipnis (whom she calls Papa Ajoba, meaning father-grandfather in Marathi). She is chronicling his stories from years of working as a makeup artist in the film industry (he began working in the 1940s). There are also audio interviews with him posted (sadly for me in Marathi and Hindi, but some of you will understand) along with photos and some video. He has a phenomenal memory. It is just the kind of documentation that Hindi cinema needs! 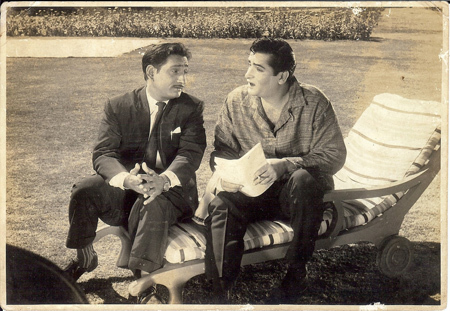 The photo above is from her collection; it pictures her grandfather with Shammi Kapoor on the sets of Janwar in 1965. He worked a lot with Shammi so you can imagine how happy I am! I am hoping and trusting that she won’t mind that I’ve posted it here along with her site URL. I know many of you will enjoy the blog too. Start at the beginning and work your way through. There are not a lot of posts (and none since January), but every single one is a gem. I do hope she keeps going. Posted on July 30, 2008 at 11:54 am in Hindi film history, Hindi movies, Yahoo! Shammi! | RSS feed You can skip to the end and leave a reply. Hey, Thats absolutely a delightful thought. Just Imagine the Chronicles of Bollywood !!! That would be of great value to for the next generations of filmmakers who can Learn. Cheerio !!! Thanks for the papaajoba link. I love the description in there of how her grandfather used to make his own makeup using colors that were used to paint houses mixed with petroleum jelly and zinc, and then boiled and strained! There are so many comments under the name “Anonymous”, so I decided to give myself another nickname. PS: is it just me or does Tipnis remind you of actor Rehman? When I first saw the photo, I thought Papa Ajoba was an actor and wondered why I had never seen him. The blog is a real find. FiLMiNDiA: I like this name! “Anonymous” is SO dull (although easy). Bollyviewer & Banno: I know, he is very handsome! Could have easily been an actor (I guess he did act in a couple of films). The photos are just wonderful, so are the interviews. In the Saif clip, Tipnis is talking about a location shoot at Delhi where he did the make-up for Saif. His Mom (Sharmila Tagore) came over at the shoot to see him and asked him who did his make-up. When told it was Tipnis, she wanted to meet him and then told Saif that he should agree to everything Tipnis says and never disrespect him. She went on to say that at the shooting of Evening in Paris he (Tipnis) used to scold “them” (I assume that means Sharmila and Shammi) a lot. Oh, shows how much I understand about what’s going on :-) Thanks for the translation. What does he have to say about Farooq Sheikh? Urgh, I really need to do something about my language skills (or lack thereof). He worked on so many of my favorite films and was in one that I keep meaning to watch (Ankhen)…I’ve moved it up in my queue to see this weekend. Just the way I used to work for “pictures”, i have also done tv serials, about 6-7 of them, produced by eagle films. There is a serial called Office-Office, i used to do everyone’s makeup. One day what happened, an artiste called me, he said Farooq Sheik wanted to meet me. I told I have never worked with FS,the artiste told FS just wanted to meet me. So I went and met him. Farrooq Sheik asked me how I did the makeup for the lead actor in Off-Off, Pankaj Kapoor. I said i did makeup for him, just like i do for everyone else. FS said no-no, where did you get the wig for Pankaj Kapoor, I said, No wig was used. FS then asked, how is it possible? I then told, I have just done painting on his hair using brush and black pencil. FS then said that I have worked with some big actors for many years, so FS wanted me to record all that experience, in a tape and wanted that to give it to FS. I will write a book on that, and it doesn’t matter even if a single copy is not sold. 10 years later someone might get hold of that book and read how the makeup work was done all those years ago and what kind of people there were. That really is fascinating. I remember watching that Nasreen Munni Kabir doc on SRK in which he introduced them to his makeup artist and I remember thinking, wow that sorta looks… crummy. And yet, it looks way better on screen. To know that that’s a step up, and that they were using house paint in the old days – and making them look gorgeous! – it just blows my mind how much of the moviemaking process in India was invented on the fly. “On the fly” is such a perfect way to put it :-) Necessity truly is the mother of invention! Thanks for the link! Wow! As it is, I’m a buff for anything relating to the past and getting info from those days! And yes, love Shammi Kapoor too! Leave comments for her so she keeps on going :-) Glad to have another Shammi lover around! papa ajoba blog is really fantastic. So much behind the scene materials. I am at present reading a book written by Mr.Mihir Bose on Indian Film Industry( it’s rise from early 30s to present days) and it seems that he may have used some information available on such blogs. it contians lot of details about Indian film industry. Any film history lover shuold read this “memsaabstory” and “papa ajoaba” like blogs and enjoy and get enriched.